We do not learn algorithms from nature; instead, we project our algorithms onto nature in order to make meaning of it. If we do this — carefully and critically — then Nature, on occasion, can point out where we are mistaken and thus motivate us to try anew, or, more often, to refine and slightly modify our existing repertoire of algorithms. As such, algorithms are primarily in our minds, a way for us to share — and thus create — meaning and understanding. They are only read into the world by our attempts to assign Nature sense and meaning. It is not the case that there are algorithms underlying nature for us to simply discover. Much like there are not true names underlying objects. I think there are two particularly salient features of algorithms that we should focus on: they are self-contained and communicable. The communicability suggests an analogy to language. In fact, the mention of ‘true names’ is meant to hint that our question can be informed by an old philosophical problem. Now it is merely dressed up in the modern garb of computation. As such, in this article, I will first chase a few historic threads before returning to my algorithmic philosophy and Gaudi. The oldest precedent of this discussion for me is Plato’s Cratylus. In this dialogue, Socrates, Hermogenes, and Cratylus debate the correctness of names. Hermogenes advocates for conventionalism — that word meanings are assigned arbitrarily and conventionally by their users — while Cratylus and, to a lesser extent, Socrates advocate for naturalism: names for objects cannot be chosen arbitrarily because objects have true names and a good language reflects this. Cratylus goes as far as saying that speaking of anything by a name other than the true one is senseless; in such cases, one is referring to nothing at all. With an atypical air of confidence and good self-deprecating humour, Socrates leads us towards this true language — probably some variant of Greek for Plato — by tracing the etymology of a few philosophically significant words. By tracing this etymology, Socrates is learning the word’s true names and thus the Platonic Forms that they denote. This ancient caricature seems easy to deny and parody, and its ethnocentric bend is evident. In fact, a lot of the modern readers of Cratylus take Socrates’ humor as a deflation of naturalism, although it is clear that contemporary commentators — Aristotle, for example — did not read these passages ironically. Of course, you can reject Plato’s method of etymology, while still disagreeing with my assessment of the relationship between nature, mind, and algorithm. After all, one might say that we use the more sophisticated processes of science rather than tracing etymology to learn algorithms from Nature. This tension should motivate us to track the idea closer to today and try to find the moment when it found more pleasant robes. Although the ‘true names’ or ‘true language’ perspective has lived on most recognizably among some philosophers and mathematicians, these rationalist versions would probably be passed over in silence by physicist and many other scientifically, especially empirically, minded readers. However, that doesn’t mean that we won’t find something akin to ‘true names’ if we undress the empiricist’s zeitgeist. For Galileo, this passage would have been much more literal than for the modern reader. God had revealed his will to us through two great works: the Bible and the world around us. The astronomer’s friend, Pope Urban VIII, would help us understand the great Latin book, while Galileo was happy to teach us how to read the mathematical book. But with the first and second industrial revolutions, we killed God and forgot the theological origin of the book of nature. The modern reading became metaphorical. There is now no author for the text but there is still the (usually) implicit assumption that the writing is intelligible. Although actually reading nature to the laity might still require the inspired genius of scientific saints like Einstein or modern lab-coat wearings priests. As an aspiring member of the modern day ecclesiastic class of experts, it is in my interest to believe that I am learning to read eternal truths rather than writing ones that spring to mind. It is the convenience of this belief that feeds my skepticism. But that doesn’t mean that I want to replace the scientific reading of nature by some other mystic method for learning eternal truths. Since no such method exists. Nor does it mean that all beliefs about the world are equal and grounded only in convention. I am not willing to swing as far towards conventionalism as Hermogenes. Rather, I think that we have to take a Kantian stance in between. The world in itself — the noumena — is not directly accessible nor necessarily intelligible. Instead, we rely on the phenomenal world that structured the noumenal through our methods of making sense of it. The most salient features of the structuring come from our minds and the culture that helps shape them, but the structure also involves our bodies and technologies. Thus, when we arrive at some truth, we must recognize that part of it reflects the world and part of it reflects our mind and tools. What does this mean in practice? Although the distinction is largely metaphysical, it does change which generalizations we consider first. Suppose that I keep seeing the multiplicative weight updating rule or power-laws crop up during my investigations. If I believe that I am learning algorithms from nature then it feels natural to generalize that there is some deeper Truth about the universe that my observations are hinting at. However, if I believe that I am projecting algorithms onto nature then this just highlights my limited repertoire of mental models. From this perspective, when different fields keep finding similar things — especially foundational things — then my first instinct shouldn’t be to celebrate the unity of nature but to mourn the lack of diverse perspectives and approaches. And since my tools constrain or shape the sort of truths I can arrive at, I must be extra mindful of the fact that I cannot simply choose independently problems to work on or questions to answer; I have to look at problem-tool pairs. Of course, we don’t need to look for important examples buried in the philosophy of science. There are also direct concerns on how we implement social algorithms and how we make claims of ‘objectivity’ or ‘correctness’ for inferences made about people from big data or other models. But that discussion is better saved for another post. The perspective I sketched above makes Gaudi’s opening quote on the imperfection of Gothic revival easier to unravel. His references to tools (compass, formulaic industrial repetition, buttresses, crutches) highlight the interplay between the method and the final product. An interplay that most architects and designers have to be attentive to. It also pushes us to look into Gaudi’s method for representing, conceiving, and communicating his vision. Whereas most of his contemporaries relied on architectural drawings, Gaudi preferred to build three-dimensional models and improvise during construction. The few drawn plans that he did produce were mostly to appease the authorities that demanded them. His physical models allowed him to externalize computation to nature, instead of trying to learn its algorithms and disrupt them by the projections of an internal representation. To design his arches, for example, he would sketch the floorplan on a board and then hang strings with weights on them from where he wanted the columns to start, adding more strings as he saw fit. This created an upside down force model. A photo of the resulting suspension when turned right-side up provided the arches and columns that Gaudi wanted. In this way, his method was not self-contained and thus less algorithmic. Gaudi escaped the rationalist rigidity of Gothic revival by projecting fewer of his own algorithms onto nature. He recognized that he couldn’t learn algorithms from nature to then simply apply this knowledge to construction. He had to draw inspiration from and work with nature for a final product. If he had tried to extract and codify the essence of a natural style then I suspect that he would have instead learnt a pattern of his own projection and recreated it with formulaic industrial repetition. Instead, we got the Case Mila, Sagrada Familia, and other great architecture in and around Barcelona. I’ve touched on these ideas of the connections between algorithms, the world and mind before in my posts on Gandy’s physicalist and Post’s Kantian variants of the Church-Turing thesis. As might be obvious from those articles, my position is closer to Post’s than to Gandy’s. If we must learn about the world around us and not just the Forms then Plato allows this, too. This is because the world around is just a shadow of the Forms, so knowing the forms is strictly better. Of course, for Plato, the Forms and not the imperfect world was the target of Knowledge, so he didn’t bother to explicitly worry too much about the latter. To stay with the steps of language, it is tempting to look to the analytic philosophy of the linguistic turn. Here, we can see Plato dressed up in the styling of the Logical Atomism of Russell and, to a lesser extent, early Wittgenstein. They maintain the idea of words denoting of the world and the dream of an ideal language. However, the logical atomist knows that her common language is limited, and since she might have learnt to read the ancient Greeks in their original, is aware that their language fares no better. Overall, Plato’s (pseudo)historic perspective is distinctly non-modern. The modern scholar expects to progress to the ideal language, not find it in the past. She aims to build the perfect language for herself through reductive analysis. In logic, she hopes to eliminate all ambiguity in finding a one-to-one correspondence between words and objects, propositions and facts. For the logical atomists, the world and the true language become the same and all hard questions are reduced to the epistemology of learning the logic from our experience with the world and the structure of our current faulty language of descriptions. Of course, claiming the authority to interpret the book of God is not the best idea during the Thirty Years’ War and can land one before the Inquisition. The popsci accounts of Galileo like to imagine him as a champion of scientific truth and dispeller of Church mythology, a radical martyr of a new scientific world view. But it is not clear to me that the dispute that occurred was really as far outside the Church mainstream as we like to tell it. It can be viewed as a part of the ongoing theological debate at that time over who can interpret the holy books and which books should have primacy. The emerging Protestant sects were encouraging the laity to read and interpret the Bible for themselves, while the Catholic church saw the priest as a necessary mediator. Galileo was claiming to interpret God’s work and suggested that his reading of the book of Nature was authoritative. The claim of authoritative reading was the point at issue, and the fact that the reading resembled something that would eventually become science was purely incidental. His magnum opus – – Le Sagrada Familia — is a testament to improvisation: when I visited it over 90 years after Gaudi’s death, it was still under construction and projected to remain under construction for another decade. One of the things that draws me to medieval Gothic cathedrals – – the ones that were built between the 12th and 16th centuries and inspired the Gothic revival or neo-Gothic in the 18/19th century – – is that a single cathedral would have been constructed over several lifetimes and worked on by many architects and master craftsmen. This makes the construction procedure not self-contained, with the mental models of many agents shaping the final product. It allows a break of the “formulaic industrial repetition” and lets the cathedral adjust to how it has been worn and ‘mutilated’ by time. When it is being finished, the new architects can already see how nature has taken its course with the older parts of the cathedral and accommodate this in their development. By contrast, the buildings of the Gothic revival and neo-Gothic were constructed much faster and from the vision of a single designer; making the projections of their creator much more evident. Although many other pieces by Gaudi, like the Casa Mila, were conceived and built solely by him — in collaboration with many artists, architects, and craftsmen; to whom he gave great autonomy — the distributed construction of Le Sagrada Familia points to another departure from neo-Gothic and a return to a more traditional style. The lack of clarity on what I mean by self-contained is a hole in my views on this topic, but hopefully, doesn’t leave my position in tatters. To see this, consider the example of hanging up clothes to dry. I can specify a procedure like: draw a rope between the two posts in the backyard to make a clothesline, start with your largest bedsheets and drape it in the middle of the clothesline, if only one of the edges touches the ground then pull on the other edge until it hangs at the same height as the first, if both edges touch the ground the tighten the clothesline, etc. I would consider this to be an algorithm. However, like Gaudi’s method, it relies on gravity and physical geometry for solving subproblems like sag of the clothesline or the midpoint of the sheets. Yet it feels that these aren’t the ‘central’ parts of the clothes hanging algorithm but are just well used physical constraints. It feels like they aren’t essential to an abstract representation of what’s happening. 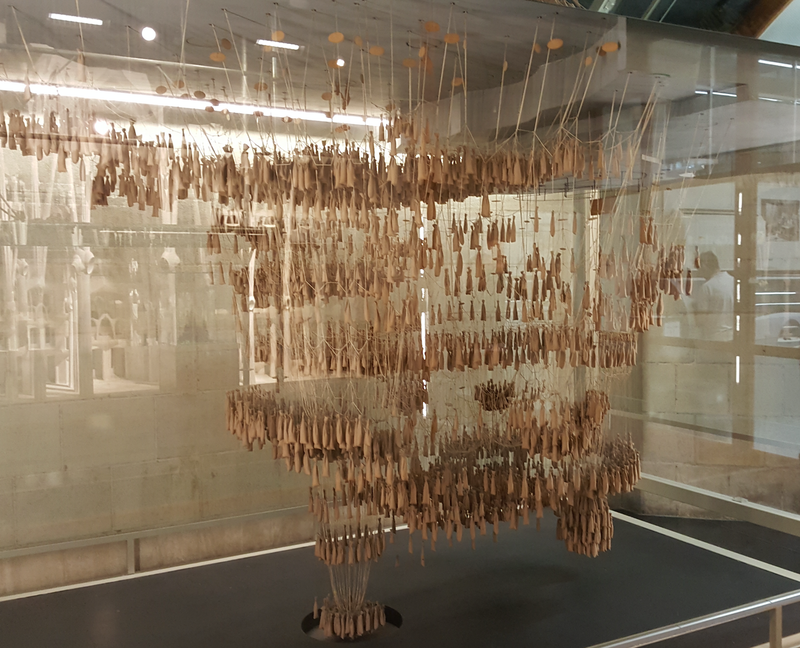 For Gaudi, on the other hand, gravity does the ‘real work’ of forming the representation. When I started reading I was anticipating a good strong disagreement, which would have been wonderful, as we haven’t managed to find one, yet. Turns out it’s far more complicated: I disagree with your starting point, or how you frame the issue, but don’t disagree with the sentiment. The frame: how can we not learn anything from nature? Metaphysically, my inclination is to reject the distinction between natural and … what else? I am even unable to understand what the distinction could single out: in smaller domains, I can see that there is some sense in distinguishing between naturally occurring systems/structures and designed ones, but when we widen the scope, and reach metaphysics, how can we say that something isn’t natural? If it isn’t, am I supposed to be consider that something can be supernatural? This is relevant to what you are aiming at because from my stance, cognition is and has to be considered natural, and therefore language, reasoning and algorithms as tools used to understand the world are part of naturally occurring phenomena. As a consequence, saying that we don’t learn algorithms from nature fails to make sense: everything we can ever learn we learn from nature. Thus, when I started reading, I was thinking “good, this time we can disagree in a very fundamental way, so perhaps we’ll be able to learn from one another”. However, reading on, it became clear that your aim is slightly different, and I can’t disagree with it, if my reading is correct. I’ll try to write down how I understand your main point, to check if I’ve got it right (I’m finding your prose harder to follow, lately; for example: I can interpret expressions such as ’empiricist’s zeitgeist’ in far too many ways, so I’m not too sure I know what you mean by it). This is what I think you’re saying (expressed from my own point of view): algorithms are all in our heads (I make a similar/related point here). They are a product of how we think and communicate, which is a product of how our brains work, shaped by how we perceive the world, shaped in turn by our ecological specialisation(s) via evolution/natural selection. Perception has to be indirect, making the Kantian distinction between noumena and phenomena make perfect sense. I personally prefer to stay away from Kant and make the argument via other routes, but I suppose it’s just a matter of taste! The world in itself — the noumena — is not directly accessible nor necessarily intelligible. Instead, we rely on the phenomenal world that structured the noumenal through our methods of making sense of it. The most salient features of the structuring come from our minds and the culture that helps shape them, but the structure also involves our bodies and technologies. Thus, when we arrive at some truth, we must recognize that part of it reflects the world and part of it reflects our mind and tools. Anyway, I think the point here is that every single bit of our own understanding (of anything) is shaped by how we look at things, just as much as what we are looking at. I think we agree in believing that there is no single foolproof system to disentangle the two elements (“how” and “what”, to give them neat labels). Therefore, when we do understand something, we cannot say it’s a universal truth, or that we’ve found something metaphysically objective, because every bit of understanding we have is always also a function of how we understand things. Applying this meta-understanding to algorithms, we therefore seem to agree: algorithms are mental constructs, they are a paradigmatic example of “how” we understand stuff. When we find an algorithm that works, we do reach a better understanding of “what” happens out there, but this understanding isn’t a definitive, objective universal truth about the “what”, because it’s a clear case of an understanding that is heavily dependent on “how” we understand stuff. Rephrased in this way, I would agree without reservations, but I’m not too sure my interpretation is correct! From this perspective, when different fields keep finding similar things — especially foundational things — then my first instinct shouldn’t be to celebrate the unity of nature but to mourn the lack of diverse perspectives and approaches. Here it seems to me that you are going one step too far, and might be deliberately pushing epistemological humbleness into counterproductive territory. My reasoning is as follows: everyone’s mental powers are limited, therefore, simplicity is an asset. If I can redeploy a given conceptual construct to produce accurate enough understanding of a wide range of phenomena, that’s a good thing. I agree that I should not jump to the conclusion that I’ve discovered a metaphysical truth, but since I don’t recognise this temptation in myself, I tend not to worry too much about it (I might be very wrong here!). However, I like to think in terms of being less wrong: the more a conceptual construct is fruitfully re-deployable, the more useful it is, which means it also makes inductive sense to consider it as more fundamental than narrower context-dependent constructs. It remains a function of how our brains work, but its usefulness is equally justified by the “how”. Therefore my reaction, when confronted with foundational and versatile explanations, is one of celebration: I do not (or hope/believe I don’t) celebrate the unity of nature, I celebrate the fact that we can achieve some decent understanding of lots of “whats”, while saving precious mental resources. Now, I do understand that your angle is different: you actively look for new tools, and/or new ways to develop and expand old ones, while I frequently get excited when I find ways to make hard stuff easier to understand. So I guess this disagreement is a good example of how our different “hows” directly produce different (meta)understandings of “what”. Which perhaps nicely closes the circle. Finally: I’m glad you ended up visiting Barcelona. I’ve spent about a week in there, walked it up and down in every direction, and loved every minute of it. It’s an architectural flâneuring paradise, Gaudí merits a big proportion of the credit, but by no means all of it. Thank you for the comment, and sorry that there wasn’t more for us to disagree on. Hopefully, that clarifies what I intended in that passage. Overall, your interpretation in the comment sounds like what I wanted to say. As for the general ambiguity of language in recent posts, I’d like to claim it is intentional and part of a build up towards a series of posts on the positive aspects of ambiguity in language and models. But that’s not the case. The more like culprit: I wrote parts of this post a really long time ago (probably two years ago) and it languished in my drafts. Barcelona gave me the final piece/nudge to finish it. As such, as I was editing I probably wasn’t completely clear on how I had wanted to express myself originally, and just deferred to past Artem (although he probably intended supporting sentences of paragraphs to some of the ambiguity that current Artem has forgotten). Sorry. For our point of disagreement at the end of your comment. I think here I was being overly provocative when I wrote: “mourn the lack of diverse perspectives and approaches”. I see myself as specializing in seeing common themes/tools in various disciplines. By more rigorously specifying that tool in a target discipline I can then move extensions developed in a source discipline to raise new questions or provide new answers for the target. In that regard, I am happy to find the same techniques popping up. But notice that I am not using things about “the structure of the world” to move forward there. Instead, I am using “the structure of the tools” that is better developed in one discipline than another. The reason that I went for the provocation, is because I see too many articles that say stuff like “stars are distributed according to power-laws, so are cities, so are neuron connections; oh marvel at the unity of the universe!” Most of these pop-sci articles actually highlight examples where people don’t account for how powerful their tools are and how easily they can describe anything & everything. In the special case of power-laws, it is actually due to well understood statistical mistakes. See for example this blog post. I believe that the reason people don’t catch these mistakes often enough is because their instinct is to marvel at the unity and thus not look for the limits of their tools. But if the first thought is disappointment then one might turn to questioning their tool. My response is to point to Hempel’s dilemma. If “nature” just means “absolutely everything we will consider in ‘scientific’ discourse or experience, ever” then it is not a useful word, and the reason that nothing is “super-natural” is not an interesting fact of the world but is definitional. If we instead define “nature” up from our scientific theories and what is included in their discourse then nothing about nature can be theory-independent since we are defining nature in terms of our theory. I prefer to use “(the) physical” for that (since we usually try to ground in physics) instead of “nature”. So what options are we left with? Probably many still, but I prefer Kant. We separate out our mind (in a suitably generalized sense, maybe) from the ‘external’ and build our definition of nature from there; it is the things ‘underlying the external’. This allows us to define nature with regard to which tools we are willing or unwilling to question. If we are willing to question and examine everything then nature might become the noumena. If we are willing to question only the things we build/engineered the nature might track to the common-sense distinction between ‘natural’ and ‘artificial’. If we are we are willing to question only well-specified details of our scientific theories then nature might correspond to ‘the physical’ from before. I prefer this flexible and slightly ambiguous position. Would you include scientific laws/models/theories in your algorithms? I would and agree with you. I don’t think I had ever really connected my understanding of law (they are our constructions, not part of the action in the world) with my nominalism. But they are the same thing. Oh, and thanks for introducing me to Modernisme. Yes, I would include scientific laws & models under algorithms. This is especially true of well-specified laws/models such as those we see in physics. Theories are a bit more difficult point. Some theories are mostly self-contained (like those in physics) but others are very ambiguous and not self-contained. These latter theories would only be algorithms under very broad definitions of the word. In fact, I view my research in many ways as formalizing the algorithms implicit in more vaguely specified scientific theories. See for example: what can theoretical computer science offer biology? Thank you for starting this discussion, though. I have a post in the works defending the ambiguity of verbal and non-mathematical theories (against my own attacks of the past, among others), and I didn’t think too much about explicitly connecting it to this post. I will think more about that, now. I am glad you like Modernisme! I had seen Gaudi a bit on the internet and it had not had a strong impact on me. But actually seeing his buildings and furniture next to more traditional works in Barcelona was very impactful. I wish I knew more about architecture so that I could appreciate and understand these things more. I’d like to add a quick thought. I agree that your ‘algorithms question’ is an old one in new clothes, and that identifying the relevant old question is invaluable. However, I think that the language perspective misses a great deal (although not as much the architecture perspective.). In a very concrete sense, algorithms and mathematics are equivalent (https://en.wikipedia.org/wiki/Curry%E2%80%93Howard_correspondence). With this in mind, you’re asking a very old question: what is the relationship between mathematics and nature? Having had a quick look around the blog (and spoken at length with you in person) it’s evident that you already know all of this. I’m curious as to why this isn’t more central to your argument? Since the death of Kant, mathematics has experienced the lives of Hilbert, Russell, Godel, Turing, Church, Cantor, Wittgenstein and others (and the accompanying foundational crisis). I don’t claim to be an expert on the work of any of these people, but I have to believe that they made relevant and real progress towards answering your question. At the very least, the answer need not simply be either ‘natural’ or ‘not’. There is a much more nuanced spectrum of opinions on both sides of the fence. Finally, to add my own opinion. I’m inclined to agree with Sergio’s comment above. The question seems heavily dependent on the definition of ‘natural’ you chose to take. To me, this makes the whole thing quite unsatisfying. Thanks for joining the conversation, Dan! You are right in that I usually like to reframe many philosophical discussions from the perspective of philosophy of math. I’ve usually found it to be very useful and a good way to throw away some unnecessary baggage. Why didn’t I do it this time? Well, mostly it was because of where the writing ended up taking me. The angle I ended up finding was through language. Although I do mention Wittgenstein in Russell’s contribution in footnote 3, since it was based around language. In fact, much of the relevant development in philosophy around the time you mentioned followed this thread of language, but a highly logical/mathematized approach to language (keeping with your urge to go Curry-Howard-Lambeck). Now time for some push back, and why I think that the sort of ‘learning algorithms’ that I was addressing here is not quite the same as the standard discussions about the correspondence between mathematics and the world. First, the usual issue when we are thinking about mathematics is the magical nature of proof (something that Curry-Howard does highlight) and how various mathematical facts end up “hanging together” so well. I don’t think this is relevant for the sort of learning of algorithms that I disscuss here. In particular, it wouldn’t much matter to me if the ‘learned’ algorithms hung together well or not. Much like physical laws don’t need to imply each other or have common foundations to be interesting physical laws (think GR and quantum), although we would prefer to find such. Second, I also don’t think that my case rests in a fundamental way on if algorithms exist in nature or not (as would discussions of do numbers exist and in what sense?). Although I do take a stance leaning towards no. However, it is just conceivable that algorithms exist in/underly nature and are unlearnable. In fact, much of CoLT would suggest this case if we assume the world is significantly more complicated than DFAs (relevant old post on this). Third, I didn’t want to necessarily commit myself to expressing algorithms mathematically. Although obviously, that is how I prefer to think of them. But as I touch in footnote 6, how exactly we express an algorithm depends on what level of self-containment we are comfortable with, and I would like to leave some ambiguity here if possible. I didn’t have architecture in mind when I first started writing this post a year or more ago (and when we briefly chatted about it and you reminded me of Pete’s paper; still need to write on that), and fit in here only since it was an inspiration to actually get the writing down. Since adding it in, though, I am starting to think that architecture is a pretty good domain for reflection. It has an advantage over mathematics and (to a slightly lesser extent) language in that it is fundamentally and obviously physical and social and tool-constrained. It is much easier to think of mathematics or language as living exclusively in our minds or maybe (if we are slightly less reductive) in the minds of our fellow people. Architecture, however, clearly lives both in the minds of the people that interface with it and in the physical world. So maybe if we are trying to think about the interaction of body and mind, it might be useful to have a domain that isn’t conceivable all in the head? As a non-mathematician/scientist, I offer with considerable trepidation the following comment on liking/preferring Gaudi over Gothic cathedrals. I think this preference is aesthetic/taste: some like me prefer the Parthenon over Gaudi or Art Nouveau/ Why? Perhaps an emotional/aesthetic preference for the orderly over the (apparently?) disorderly? Or a preference for “inorganic” proportionate (math?) structures over “organic” structures? If these are valid distinctions concerning aesthetic tastes, what could be the underlying bases (if any)? I am not sure mathematics or “natural” explains my preference. Both the Parthenon and Gaudi’s organic structures can be rested on mathematical principles. “Natural” doesn’t seem to solve the aesthetic difference unless “natural” means “organic/living.” This comment does not challenge or even address the deeper philosophical questions you raise but it might suggest caution in using the Gaudi v Gothic as a test case. Thanks for a nice post. Gaudi’s critique of the Gothic reminded me of John Ruskin’s opposing views in his “The Nature of the Gothic”.